Need our COOL BUS™ ​? OUR COOL BUS™ WILL COME TO YOU! Did your AC break down because of the record-setting temperatures? Want to make sure your AC unit is ready for the summer months? Call us for outstanding HVAC maintenence and repair service. We repair, replace and install new heating and cooling systems valleywide for both residential and commercial purposes. Don't wait until your system fails. 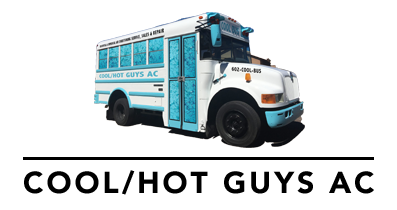 Call Cool/Hot Guys AC right now for the quality assistance you deserve. We're here to ensure our customers receive the best service possible. Period. We're proud to partner with premier brands including Trane, York and Carrier. Contact a trusted HVAC contractor in the Greater Phoenix Area today to discuss your HVAC needs. Copyright © 2019 Cool/Hot Guys AC, all rights reserved.